I’m Louisa and I live in West Yorkshire, in the UK. I grew up in Southport, went to uni in Liverpool then moved to Leeds in 2000. I worked at the University of Leeds between 2000-2006 in a range of roles in different departments, finishing up in eLearning. 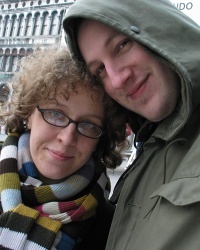 In 2006, I left for a “career break” and ended up starting lojoco, a web-ish company with my best friend, John (I’m the lo, he’s the jo, it’s our co). lojoco has produced a number of internationally renowned web-based projects but due to a variety of factors (including John spinning off to work full time for his other company, Brightbox), things are now a lot slower than they used to be. I escape from the internet on occasion to do various bits of consultancy and until July 2013, I taught two drama groups for teenagers at Bingley Little Theatre. Away from work – and I define myself away from work, I do lots of things. I make. I grow. I write. I game. I throw pots and spin yarns both literal and metaphorical. I walk woodlands and seek out hidden histories. I watch the stars and I dig the ground. I like numbers & systems, and colours & words. I’m a lifelong learner and a master of none. I’m rather socially broken but I am mostly happy. I spend a lot of time laughing and learned a long ago that dignity is overrated.